Yes. Learn to Row Membership is for those who have watched rowers and rowing shells in awe, and can’t wait to start! I want to give rowing a try! How do I sign up? Congratulations on taking a great step towards improved fitness and fun! It is our goal to always be ‘on’ the water and not ‘in’ the water. That said, rowing is a water sport and there has been the occasional instance of a rower ending up in the water. In the largest boats, or ‘eights’, it’s nearly impossible to fall in. Smaller boats are ‘tippier’ and the chance is greater that rowers go in… yet this is a rare occurrence. Our coaches are equipped to handle these situations quickly and safely, and each class watches a safety video before going on the water. Of the 8 classes, 7 of them are devoted to water training. The first class is land based, and that is where we will learn all the fundamentals of the rowing stroke. Body positioning, sequence of movements, etc. It is most important to attend the first 2 classes. If you miss 1 or 2 after that, it’s not too much of an issue. Talk to your coach if you have any conflicts. We are very flexible about make-up sessions. My hands get really cold. May I wear gloves? Gloves are not recommended for rowing, as one of the things we focus on is developing good blade work; the technique of positioning the blade to enter the water at the correct angle. Having direct contact with the oar handle is essential to ‘feel’ when the blade is in the correct place. An alternative to gloves, however, are things called ‘pogies’. Pogies slip over your hands and then slide over the end of the oar, protecting your hands while maintaining contact with the handle. JL Racing in Seattle sells them or your coach can tell you how to make some from a pair of old socks. You shouldn’t have to purchase anything special to participate in Learn to Row. The first class is land-based, learning the basics on land on the rowing ergometer. After that, once you move onto the water, dress weather-appropriately as if you were going for a jog or brisk walk. Layers are best. You want to wear clothes loose enough to move in, but not so baggy that fabric will get caught in the moving parts of the boat, specifically the sliding seat. In cold weather, remember that cotton will not keep you warm if it gets wet. Man-made layers of cool-max, polypropylene or fleece works best. Also, old athletic shoes and wool socks are recommended to keep your feet warm, as they almost always get splashed. In warm weather, hats and sunscreen are advised. While your on-water experiences will undoubtedly help with your balance and boat sense, rowing is completely unlike any other paddle sport. The technique and equipment is unique. Learn to Row is a prerequisite for anyone who has never participated in this sport. Rowing is a full body workout. The amount of effort you expend is directly proportional to the workout you will get. The first few classes focus on learning proper technique – then it’s up to you how much of a workout you get. 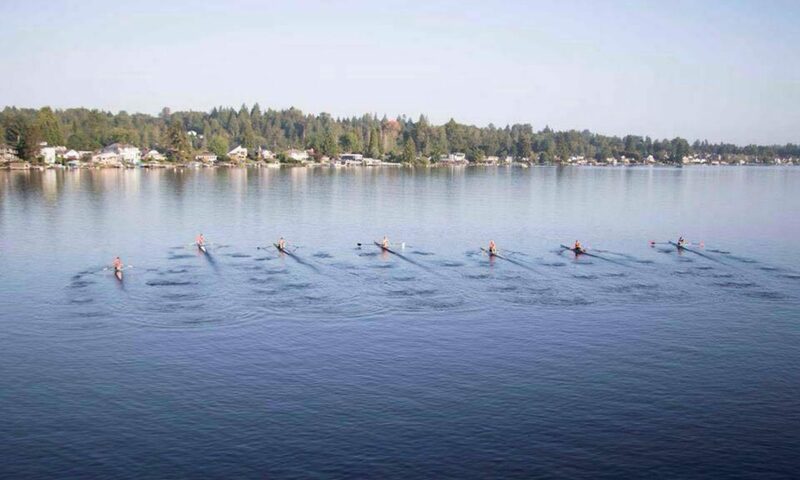 Whatever your reason for wanting to row, be it to get in shape, compete in the Olympics, or just be on the water, this class is where you start. If you have a desire to learn, we have the desire to teach you. There’s a lot to cover, and everyone will face different challenges, but the focus is on having fun and learning the basics to take you to where you want to go. Rowing is low-impact on the knees, so is great for those who have “used up” their knees skiing, running, or playing football.